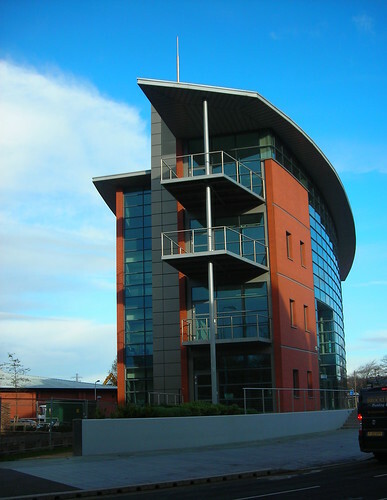 As part of the dream of Barrow Council and its redevelopment agency Furness Enterprise, this speculative office building was put up at Crazy Horse Corner, the junction of Abbey Road and Holker Street. It’s actually on the site of the art deco Roxy cinema, a much-missed town icon, and most Barrovians would prefer to have their fleapit back, if truth be known. Meanwhile, Emlyn Hughes House was ready for occupation a year ago, but has stood empty all that time while an occupant was sought. No doubt Furness Enterprise really wanted a substantial company to take it as corporate headquarters, but they have had to settle for the Crown Prosecution Servce administrative staff from the court buildings next door, who are about to take on part of the building. It’s a fine, attractive building. Update for you, a second tenant has been found for the building. Capita Simmonds a design consultancy who work mainly for Cumbria County Council will take the other floor. What a waste of an innovative building! Hey Bob – does that mean that Capita will be leaving the Nan Tait?